What analytics are available on the Dashboard? The Dashboard is the first thing you will see upon logging in to your Vimeo OTT admin. It is the main hub of activity and sales of your site. You will come here to get subscriber activity, traffic breakdowns, to see which products are selling best, and even reasons why your subscribers are canceling their subscriptions. 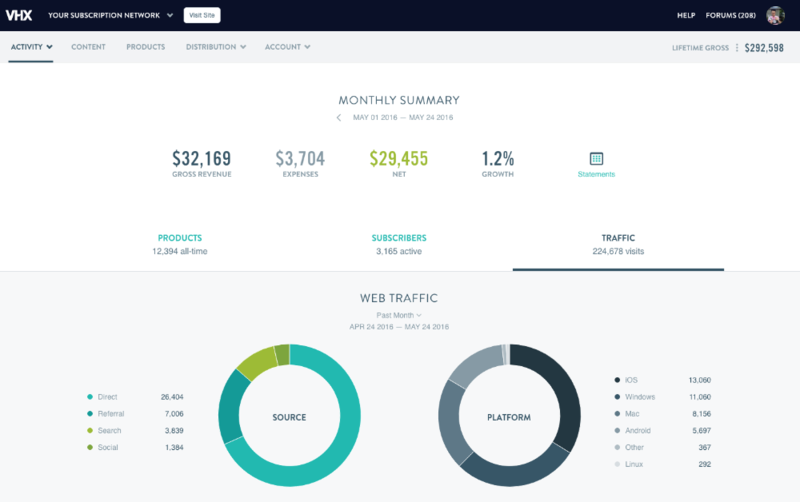 What analytics are available via the Dashboard? 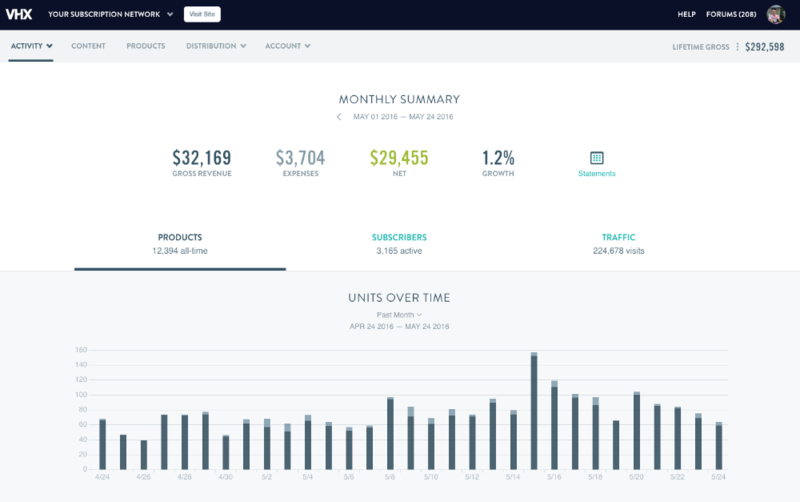 The monthly summary provides with a super quick snapshot of your current month: Gross revenue, Expenses, Net, Growth, and Statements. This is all of revenue your video network has earned on Vimeo OTT over the past month. This doesn’t count revenue made on integrated platforms such as BigCommerce, branded apps, or through the API. These are all of your fees from Vimeo OTT - fulfillment fees, subscriber monthly fees, payment vendor fees, transactional product percentage fees, etc. This is the money you get to keep! You will get paid each month. This is simply a link to your monthly payout statements. You can read more about these in the Statements guide. The Products tab of the Dashboard gives a breakdown of fulfillments and transactions of your product units. This chart outlines product units sold/fulfilled over the time period selected. You can click the time dropdown at the top to change the time period shown and select a bar in the graph to get more granular numbers for that day. Furthermore, if you click on a given bar in the chart, you well see the breakdown for that selected time period. For subscription products, charges recur monthly or yearly and for each additional transaction a new purchase or fulfillment will be recognized on this chart. Top Products outlines which products performed the best on your Vimeo OTT site. Note: If you are only selling a subscription product, only 1 product will show, like above. Fulfillment method shows the ways in which your customers have purchased access to your video content. 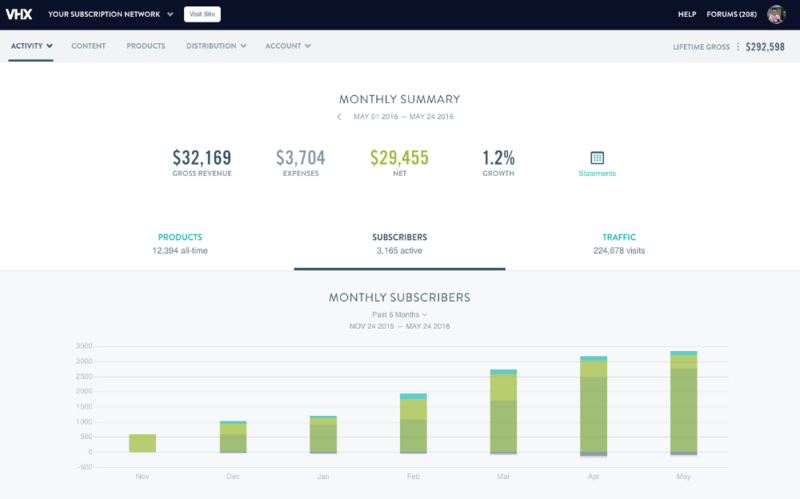 The Subscribers tab is a complete breakdown of your subscriber data. The number directly beneath the word "Subscribers" indicates how many people total have access to your subscription content, including those who purchased, are in the free trial window, and have been granted access by a site's administrator. Note: this tab is only visible to those who are running a subscription product. You can click the time dropdown at the top to change the time period displayed. You can select a time range for which to examine total subscriber growth as seen above. From this view you can also see the current number of paying subscribers as well as those who are in free trial. New Paid - New paying subscribers that started in the month. Keep in mind, if your free trial period is less than 30 days, some users will be counted as both Free Trials and New Paid within the same month. 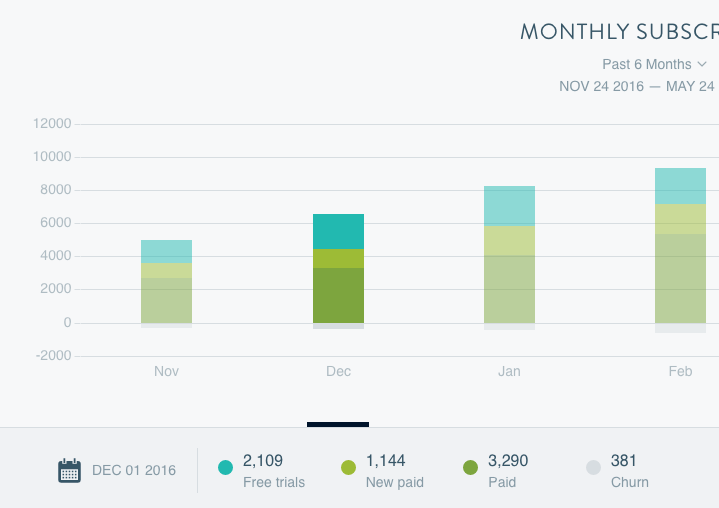 Growth Rate - Divide the Paid users from a selected month by the Paid users from the previous month and subtract 1 to get the Growth %. Trial Growth - Divide the New Free Trials from a selected month by the New Free Trials from the previous month and subtract 1 to get the Trial Growth %. Churn - For a given month, divide the listed Churn number by the Paid number to get the Churn %. 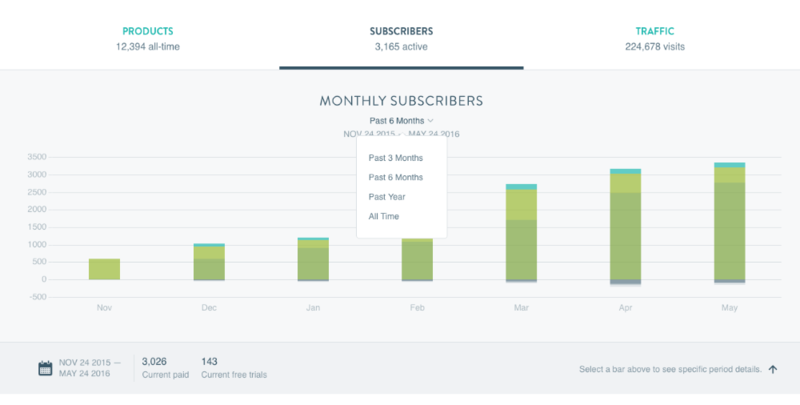 Pause & Cancel Reasons graph out the reasons your subscribers are pausing or canceling their subscriptions. Other Cancel Reasons lists all of the reasons your subscribers can enter when they cancel their subscription and also provides their email addresses in case you want to reach out. The Traffic tab outlines all of your Vimeo OTT site visitor traffic across all devices & apps. Web Traffic is just that! All the visits on your Vimeo OTT site/apps. You can click the time dropdown at the top to change the time period displayed. Top Referrers are the source sites that are driving traffic to your Vimeo OTT network. You can see the Visits, Units, Conversion Rate, and Revenue generated from each referrer. Location is the country breakdown of your customers and gives you Visits, Units, Conversion Rates, and Revenue for each. Lastly, you can see a super quick breakdown of your Vimeo OTT stats via the mini dashboard in the upper right of the Vimeo OTT Admin. Where can I see all transactions for my video products?